This was Ms Vy introducing us to the next stage in our Morning Glory Cooking Class and we were already quite full. The cooking portion of the class hadn’t even started yet and so I opted to try only the Pork Belly (which was like Chinese BBQ Pork and yummy) and the Jellyfish Salad. I was curious if the jellyfish was the slightly slimy item I had once eaten topping a piece of sushi. But it wasn’t slimy at all, the texture reminding me of a perfect dill pickle and crunchy. I’m not sure of the flavour for the salad also contained a mass of herbs, chiles, peanuts and ingredients that made for a delicious dish, one that I would eat again. 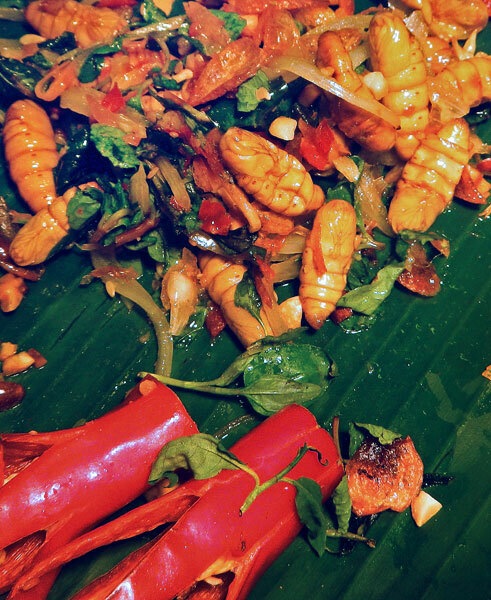 I let other people try the Silkworm Stirfry — okay, yes, I was slightly squeamish of these grub-like things. Those braver than me said that they had a creamy texture, and the stir fry was tasty. 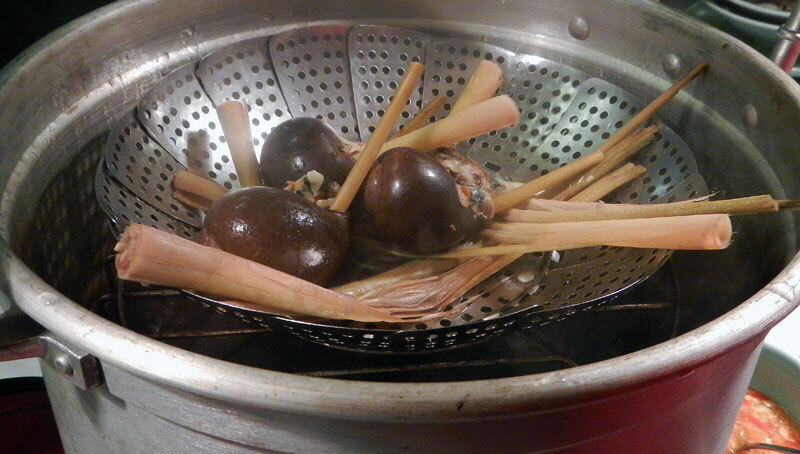 I also skipped the Snails with Lemongrass. I’ve love snails, and although these smelled delicious, I wanted to leave room for the upcoming main courses! 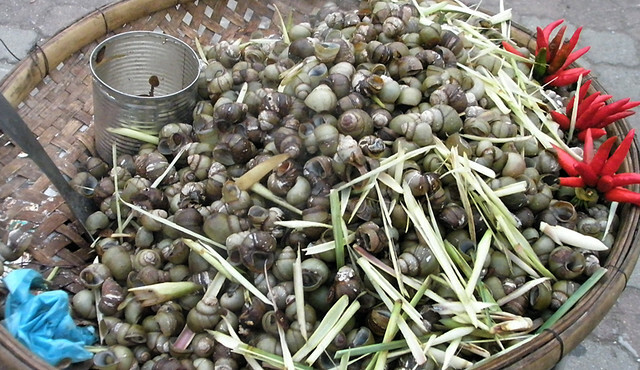 These Snails with Lemongrass and Chiles are also found in Cambodia, proving that this popular snack has extended far beyond Vietnam. 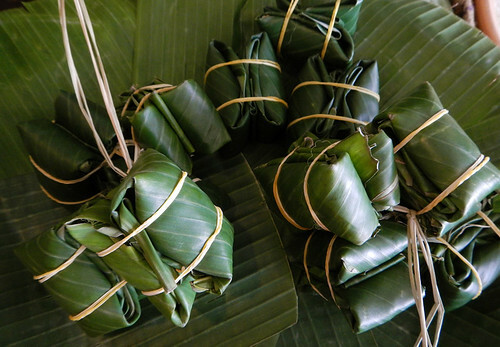 These little banana-leaf-wrapped bundles weren’t in the Weird and Wacky section but maybe they should have been! 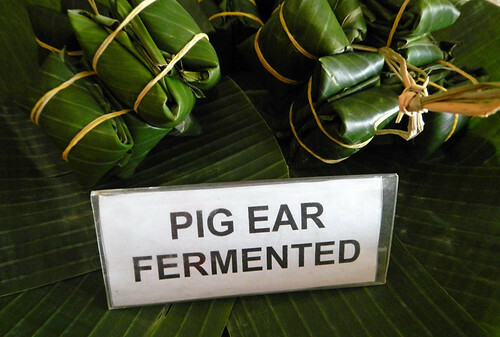 Hmmm, Fermented Pig Ear, I’ve always wondered what they taste like! 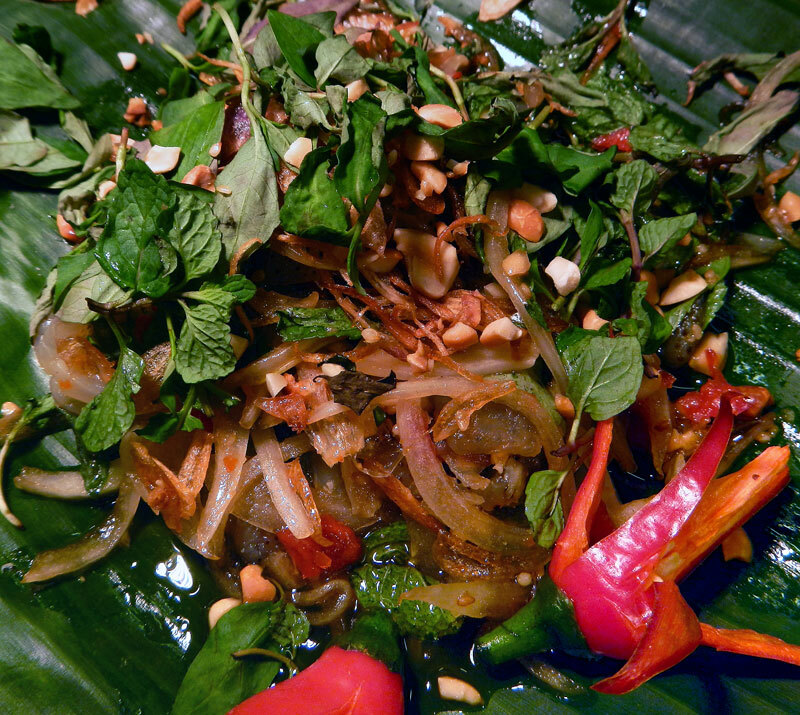 I’ve probably done a dozen posts on Ms Vy’s Morning Glory Cooking Class – it was the highlight of my 2013 trip to Vietnam and one I would recommend to everyone who visits the city. It was a little intimidating but so beautifully presented even someone like me had to try it!